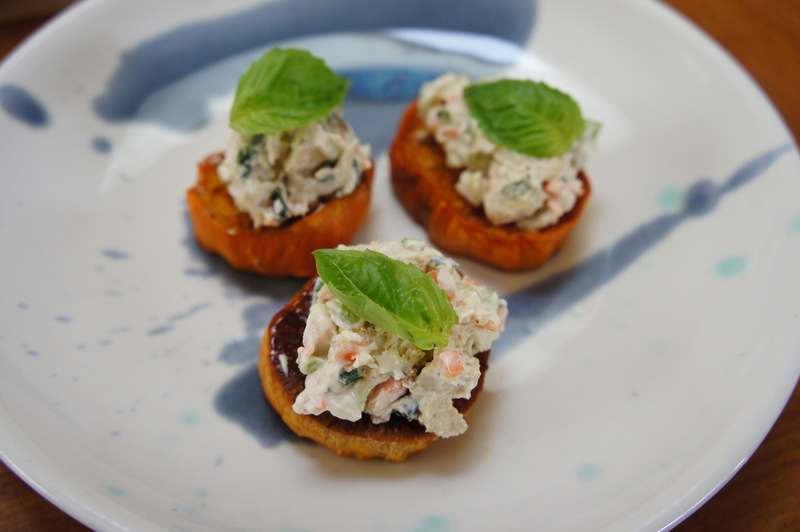 Mascarpone Chicken Salad with Lettuce Cups and Sweet Potato Circles | Kaprise! I have been sick for over a week, and have spent a great deal of time sleeping… but yesterday I was feeling so stir crazy from not having left the house in so long. My first stop was the grocery store… I was planning on browsing at the mall, but I broke out in a cold sweat from just driving to the grocery so I came home right after. I have been thinking a lot about mascarpone cheese lately… I thought about fluffing it with ricotta and making cheesecake or whipping it with maple syrup and peach preserves to make a decadent frosting for pancakes. I thought a lot about what I would do with mascarpone… but when it came down to it I chose something simple where the delicate flavor of the cheese would be unexpected and delicious. I’ve written about chicken salad here before shortly after my friend Jon visited, and this recipe is quite similar. However, as will all chicken salad recipes, this is really more of a suggestion than a recipe. It’s infinitely adaptable to suit your tastes, and if the mascarpone isn’t your style you can always use plain greek yogurt or the standard mayo instead. I served mine with crisp lettuce leaves and roasted sweet potato, but feel free to use bread or wraps! I wrote these directions in the order that I made my meal, so while the circles bake you can assemble the rest of your meal. Peel and slice the sweet potatoes into 3/4 inch coins (thinner if you want a faster baking time). Heat a little olive oil in a nonstick pan. Toss the chicken in the Worcestershire and salad dressing. Remove the chicken from heat and allow it to cool. Wash and peel the carrots and celery (no peeling for the celery!!). Wash the basil and remove any woody stems. Dice the carrots and celery. Chop the basil into small pieces. Let the vegetables rest for about 10 minutes in a clean dishcloth to remove any excess moisture. Chop the chicken into 1/4 inch cubes. In a bowl, combine the chicken and diced vegetables and basil. Add the mascarpone cheese and mustard and stir until the mixture is evenly coated. Add tablespoon increments of mayo until the desired consistency and flavor is achieved. (You may choose to simply use mascarpone, but I found it just a bit too rich and sweet for the salad.) You may also add more mustard as needed. Pop the chicken salad into the fridge while you gather the rest of the ingredients. Remove the sweet potato from the oven and allow it to cool. Gently drain and spin (or shake) the moisture from the iceberg lettuce. Arrange plates with iceberg lettuce cups and coins of roasted sweet potato. 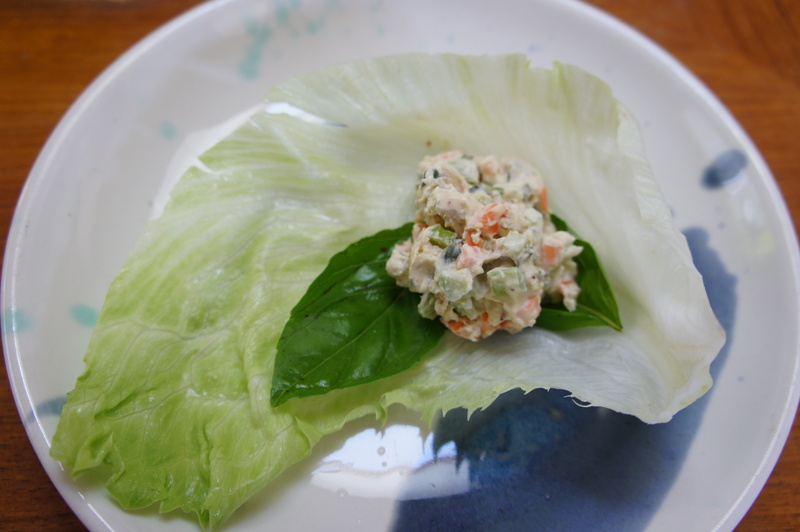 Top each with a tablespoon or two of chicken salad and a basil leaf for presentation. Thank you so much for visiting. I hope you enjoyed this recipe! Let me know if you decide to try it! Or if you would like to share your chicken salad recipes!! !